The permanent artworks arose out of my research into the history of the site. 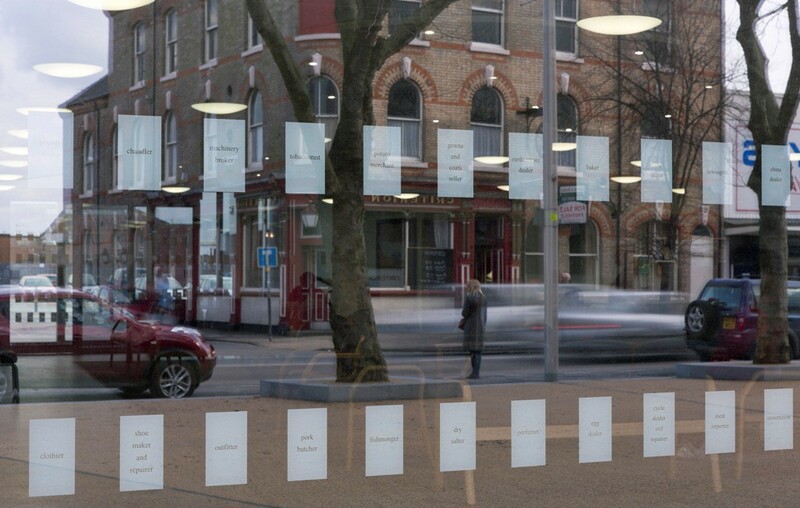 Bespoke manifestations on the glazing to the front and rear of the building represent the 52 trades that once occupied the southern side of Hessle Road between Walcott and Wassand Streets from 1889 to 1967, highlighting the road’s importance as an economic hub. 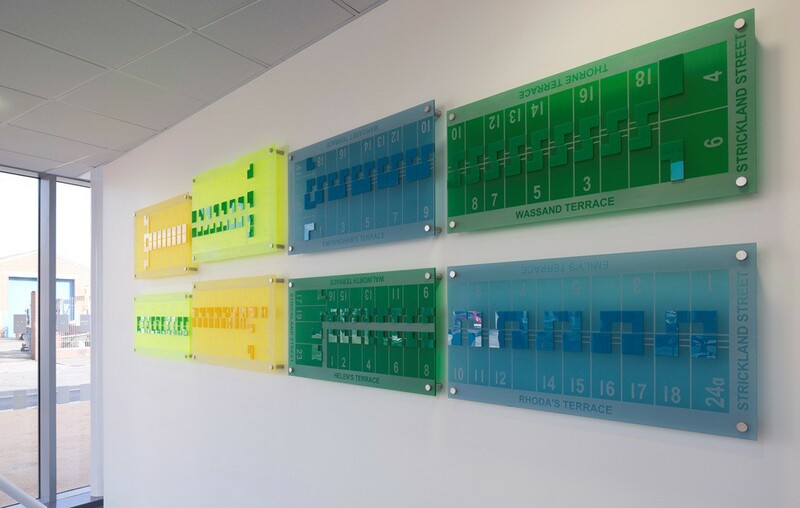 The eight acrylic panels in the main foyer were inspired by an 1888 Ordnance Survey map, which showed numerous rows of terraces that by the end of the 1970s had been demolished to make way for industry. I became fascinated by this lost community, along with the visual representation of the houses and terraces on the map. 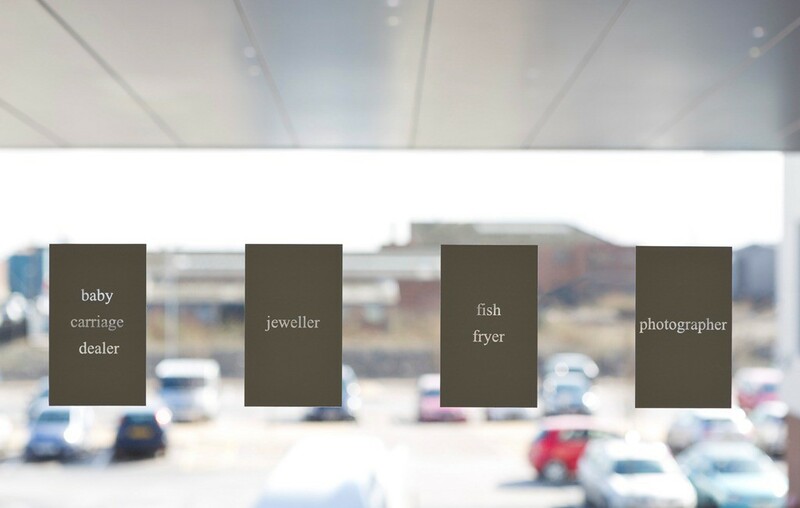 The work represents various residential blocks from the immediate area that have long since disappeared: terrace names and house numbers have been included, to allow visitors to identify the individual properties where their ancestors once lived. 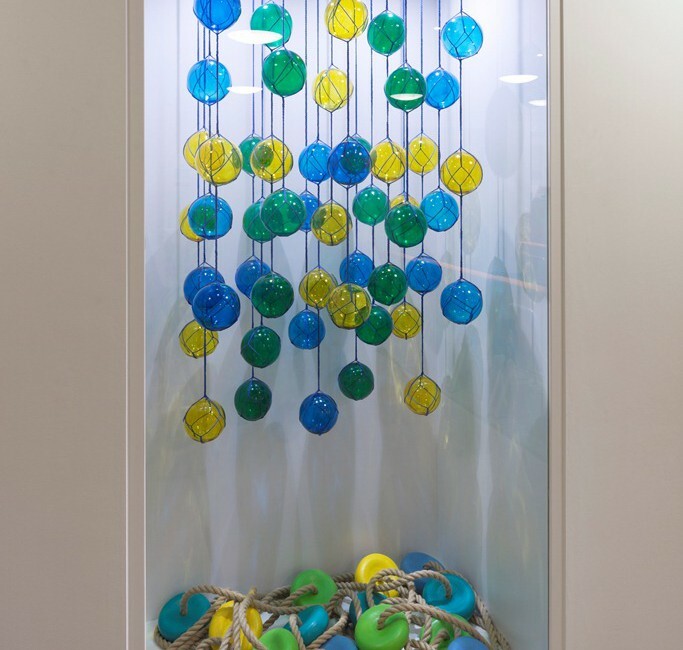 Further works are located in two bespoke glazed display cabinets, on each floor in the main waiting areas. These reference the fishing heritage of the area, in particular the nets used within the industry. These were made by women, either in their homes or at St Andrews Dock. 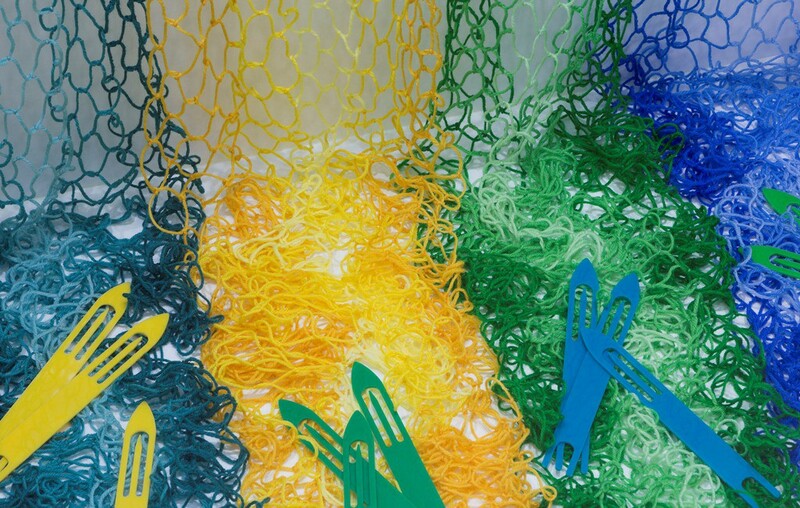 I have made fours nets, in different colours, for the ground floor cabinet, which also contains coloured acrylic net needles. 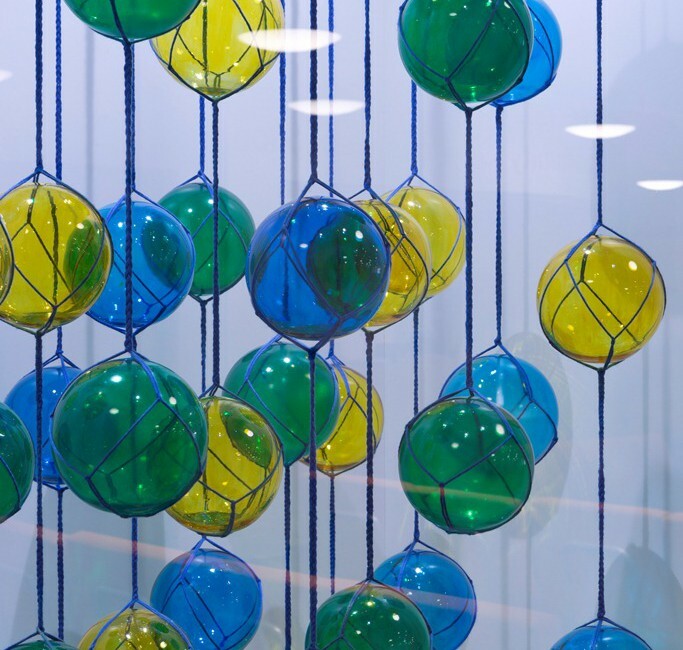 The first floor cabinet showcases bespoke glass floats, painted wooden bobbins and rope, to reference the objects used with nets on the trawlers themselves. 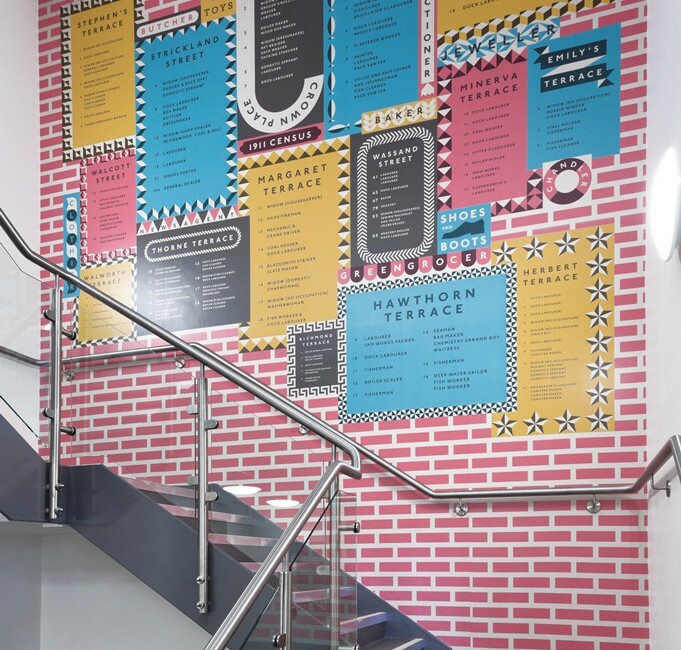 The final work, a large colourful text-based work on vinyl, based on findings from the 1911 census, is located on the stair well wall. 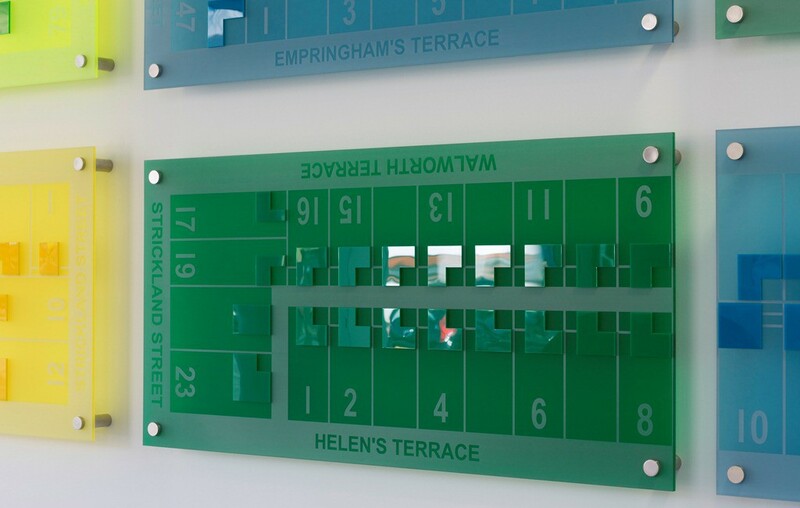 I collected the occupation data for the residents of the properties represented in the acrylic panel work; many of these relate to the fishing community, the railway industry and various trades. 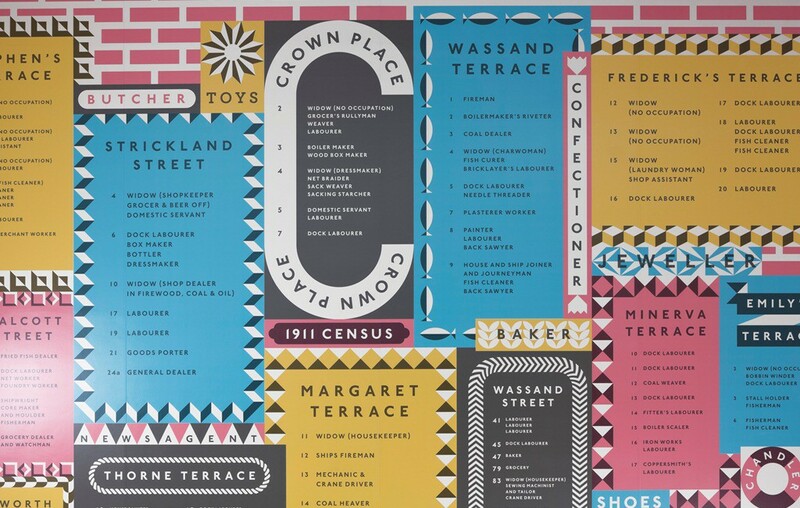 The design, created by Alfie and Edward Maddison from Maddison Graphic, reflects the red bricks used to construct many of the buildings along Hessle Road along with the way posters and advertisements were once displayed by local businesses.